Ah, good old Assassin’s Creed. Within you we can confide in some stellar stealth experiences, and a great ongoing story, all with a dash of history thrown in for good measure. The war waged between the Assassins and Templars has literally gone on for millennia, gripping gamers ever since the original Assassin’s Creed debuted in 2007. 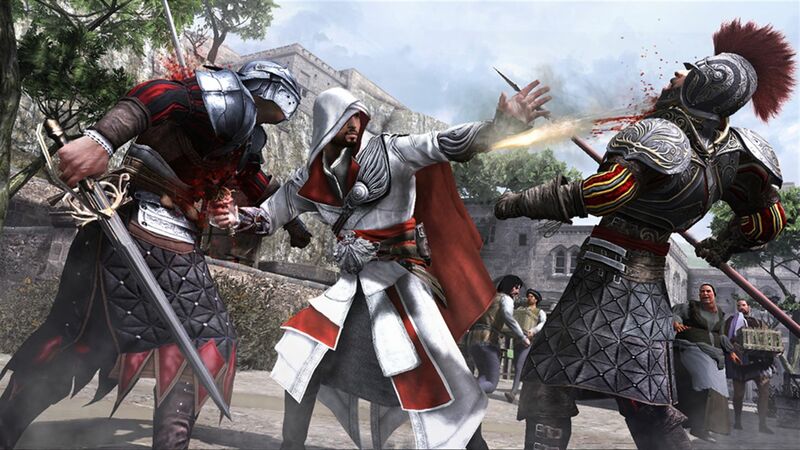 But as timeless as this rivalry is, one question needs to be resolved – which is the best Assassin’s Creed title? Behold 5 of the best Assassin’s Creed games, but we must point out none of the portable titles have been taken into consideration, nor the recent Assassin’s Creed Chronicles trilogy. Whilst Altair’s first outing in Assassin’s Creed set the series up, it was arguably quite a dull and repetitive affair. It was therefore up to its successor, Assassin’s Creed II, to put the franchise on the map, and what a great job it did. Compiling together a revenge story set within beautiful Italian Renaissance surroundings, Assassin’s Creed 2 introduced us to the dashing Ezio Auditore da Firenze and his merry band of assassin friends. 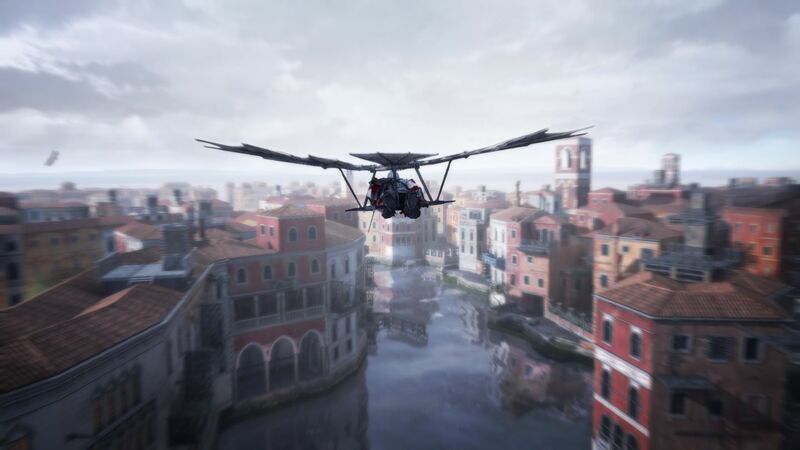 Whether you were jumping on guards from above to administer a quick hidden-blade takedown, blending in with the crowds to ensure your safe passage amidst enemies, or even soaring through the skies using one Leonardo da Vinci’s own glider, you were always having a blast with Ezio during his ongoing fight against the evil Rodrigo Borgia. Of course as with many of the AC titles this had implications in the modern world regarding Desmond Miles’ storyline – but who really paid attention to that? Assassin’s Creed II will always go down as the match to start the blazing inferno that the series would soon become, and is a fond favourite amongst many gamers of the Xbox 360 era. Of course, it can now be played on Xbox One with The Ezio Collection too. Ubisoft were on a roll – and immediately after the success AC II had, Ezio was brought back, now as an official assassin following his antics against Borgia. His next task was to continue to cripple the powerful grip the Borgias had over Italy and also to put an end to the threat of his new nemesis, Cesare. How does he go about this? Becoming the leader of the Brotherhood of Assassins of course! Whilst AC Brotherhood was more of the same for fans (and we weren’t complaining), managing the Brotherhood was also on the agenda, and Ezio could now recruit, call upon brothers and delegate missions to members of his group by destroying Borgia towers across the map. Leo da Vinci was back at it again as well, creating a parachute for Ezio to use in order to jump off buildings where a conveniently placed haystack was nowhere to be found. Unlike in other titles, Desmond was free to leave the Animus at any time and was allowed to wander modern day Monteriggioni as he pleased – hopefully brushing up on his own combat training as he went. One of the new kids on the block was AC’s very own swashbuckling pirate turned assassin Edward Kenway, grandfather to the protagonist of the lackluster Assassin’s Creed III. 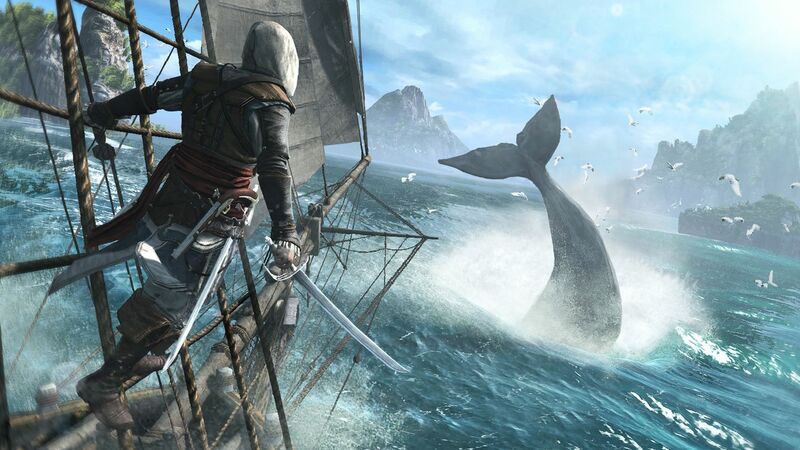 As AC’s first foray into next-gen consoles, Black Flag introduced us to something that was fond amongst many fans – naval exploration and combat. Love it or hate it, getting the opportunity to have a bit of freedom, dotting between Caribbean islands and plundering loot, definitely freshened up gameplay that was arguably going stale. Storywise and yet again those pesky Templars were up to no good and a tale of treachery, loss and, of course, action was told which coincided with what was happening over in the Desmond-free present day timeline. With improvements visually (thanks to the power of the Xbox One), tropical islands never looked so beautiful, and Black Flag was undoubtedly both a collector’s blessing and a curse, with hundreds of flying shanties, treasure chests and the like to seek out. If you can somehow manage to look past the sometimes laughable glitches and bugs Assassin’s Creed Unity contained, then the French Revolution was somewhat a revolution for the franchise. It brought a number of revamped systems and features to establish Assassin’s Creed as here to stay when many gamers were making the switch from Xbox 360 to Xbox One. Arno may not have been the most charismatic of assassins we have had the pleasure of controlling, but yet again Ubi delivered a stellar story of revolution (obviously), love and tension with the ever-present Templar Order orchestrating preceding. With last-gen consoles not holding Unity back (Xbox 360 players had to make do with the decent Assassin’s Creed Rogue), the game was heavily praised for its improvements in the looks department, how it made parkour more fluent, and for boasting AC’s first upgradable and customizable assassin as well as multiple weapons – allowing players to tailor Arno to how they played. It may have not had the impact that it was originally set out for, but the inclusion of online co-op within Unity, with up to 4 Arnos working together in missions, should be appreciated as Ubisoft trying something new. AC Unity may not be the best AC title, but it prepared the Brotherhood for a new era on Xbox One, and the success of the more recent titles can be traced back to the precedents Unity set out. And now we are up to date with the latest offering from Ubisoft, and Origins was a much, much needed breath of fresh air for a series that had lost many fans. Bayek, Senu and co. brought the series back to what it was good at whilst adding plenty of new ideas. 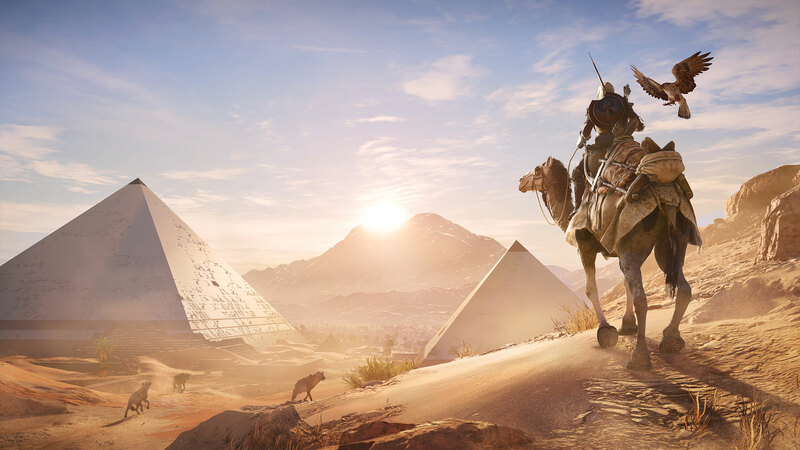 We were treated to open world gameplay with tons of freedom whilst always telling the tale of how Medjay Bayek protected his people against the changing Ptolemaic Kingdom. What’s more, being the earliest chronologically in the entire franchise, Assassin’s Creed Origins in fact let players in on how the first assassins were created, and how the Brotherhood came to be. With a number of similarities to other titles, of course Origins had to stand out, and this was achieved with heavy RPG elements found within. Players would be constantly seeking out better loot and weapons, investing skill points to improve their character, thus again shaping Bayek into their perfect assassin similar to how Unity interpreted character customization. Additionally, crafting would come into the equation as Bayek hunted animals in order to again improve his clothing and weapons. Major historical figures such as Cleopatra and the Pharaoh Ptolemy XIII played a huge role in the story of Origins and exploring the Egyptian setting, complete with temples and pyramids, was always exciting. So much so that the Discovery Tour was included as free DLC, enabling us history fans – or anyone wanting to learn about Ancient Egypt – the opportunity to do so without the constant draw of missions, enemies and collectibles. And it is with Origins that our whistle-stop tour of the best experiences Assassin’s Creed has to offer is concluded. Will the upcoming Assassin’s Creed Odyssey improve upon the excellence of Origins? And do you disagree with any of the inclusions in our list – should other titles have taken their place? Let us know below in the comments and, as always, on all our social media channels.